» Appealing Match 3 puzzles. We’ll see you when you get out of the Jungle. This entry was posted on Thursday, November 15th, 2007 at 1:01 am You can follow any responses to this entry through the RSS 2.0 feed. You can leave a response, or trackback from your own site. My boyfriend mentioned this blog post to me and I told him I truly adored it. This is your chance to become a real treasure hunter! Join Bob and Jane on their captivating adventure into the Amazon. 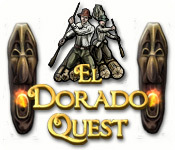 You will go step by step into the ancient Incan civilization to find the lost city of El Dorado. Wow this is a cool game! Am I supposed to find the golden king to win? I hope this is fun and challenging. Thanks for introducing the game.